In the first article in this series, you built out a simple REST API for tracking times using StrongLoop LoopBack. 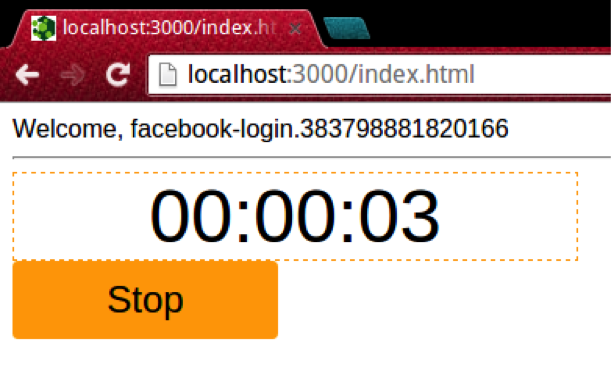 The REST API enabled you to login using Facebook OAuth and save times recorded by a stopwatch. In order to make this API useful, you’re going to build a mobile app. Remember that the Ionic framework is a tool for building hybrid mobile apps on top of AngularJS. In this article, you’ll use the LoopBack AngularJS SDK to build AngularJS directives that will be used in your Ionic mobile app. The directives you’re going to build won’t depend on Ionic, so you’ll work on them in our browser. Let’s see how the LoopBack AngularJS SDK will make building these directives easy. via remoting. The Angular code for this scope wont be generated. Saving the generated services source to "./client/js/services.js"
What do these services actually do? These services are wrappers around the AngularJS $resource service. This means that you now have a Time service which enables you to create a new time and save it like you see in the below pseudo-code. All you need to do is make your AngularJS module depend on the lbServices module. The LoopBack service takes care of translating your $save() call into a POST request to your REST API. Now what’s this user-menu tag about? This is the user menu directive in action. Here’s how it’s implemented. Note that the factory() and directive() function calls below are chained to the angular.module() function call. The $user service is a caching layer on top of the User service, which comes from the LoopBack AngularJS SDK. The User service provides a convenient interface to interact with the user REST API from the REST API article. The User.findById() function translates to a GET request to /api/Users/me. 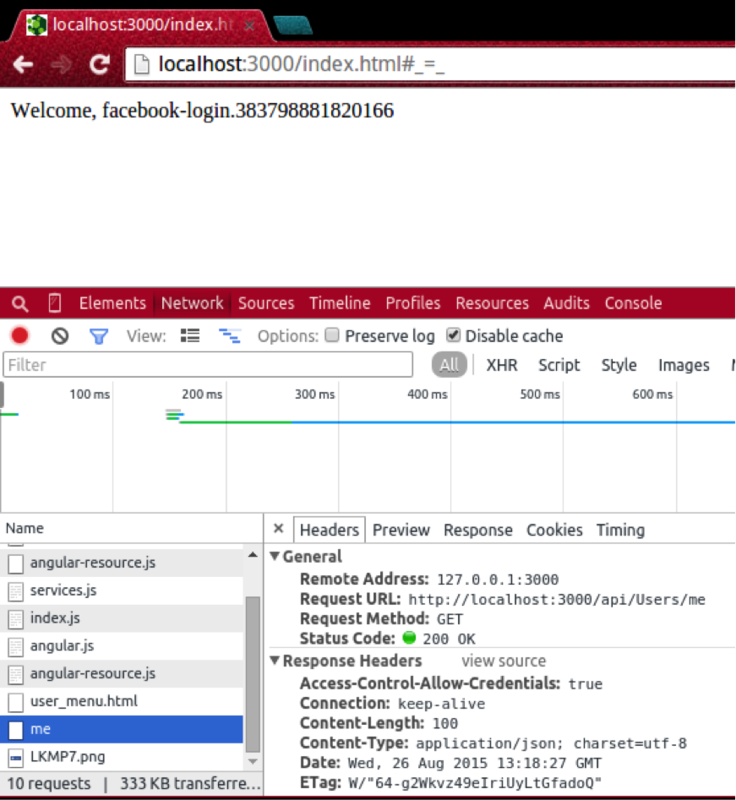 Below is the console output from Chrome when you load the index.html page. The userMenu directive attaches the $user service to the AngularJS scope, which enables the template defined in templates/user_menu.html to access it. The userMenu directive could use the User service directly; however, it’s typically better to have a separate service to track which user is currently logged in. In particular, since AngularJS services are lazily-instantiated singletons, multiple controllers can use the $user service without having to make extra GET /api/Users/me HTTP requests. You can learn more about this paradigm and other related AngularJS best practices in Professional AngularJS’ architecture chapter. This HTML defines two smaller components. The first shows a welcome message when the user is actually logged in. The second shows a Facebook login button if the user is not logged in. That’s it for the user menu. Now you’re ready to build the real functionality for the stopwatch app: a timer directive, and a directive that shows a list of times. So far, you used the ‘User’ service to build a simple login button. 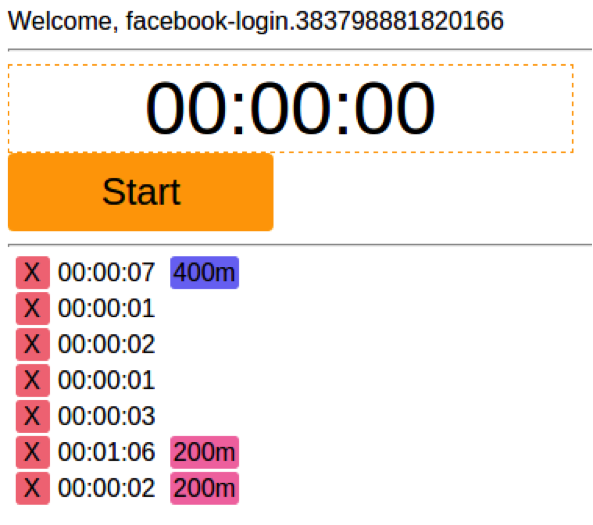 You can use a similar paradigm to build the actual stopwatch functionality using the ‘Time’ service. The ‘Time’ service corresponds to the ‘Time’ API you built out in the first article in this series. Using this service, you’ll build out two directives; an actual timer, and a list of times that have been recorded. First, let’s take a look at the timer directive. The timer directive has a few subtle quirks. As you’ll learn in the final article in this series, it’s pretty easy to test this directive in a CI framework, but for now you’ll just eyeball it in the browser. The timer directive is organized as a state machine with the following states. The ‘INIT’ state: the initial state. The ‘RUNNING’ state: the timer is running. The ‘SUCCESS’ state: the time has been saved successfully. Here’s how the states look visually. First, there’s the ‘INIT’ state, where the user hasn’t done anything. Next, when the user hits ‘start’, the directive enters the ‘RUNNING’ state, and a ‘stop’ button shows up. When the user hits the ‘stop’ button, the directive enters the ‘STOPPED’ state. 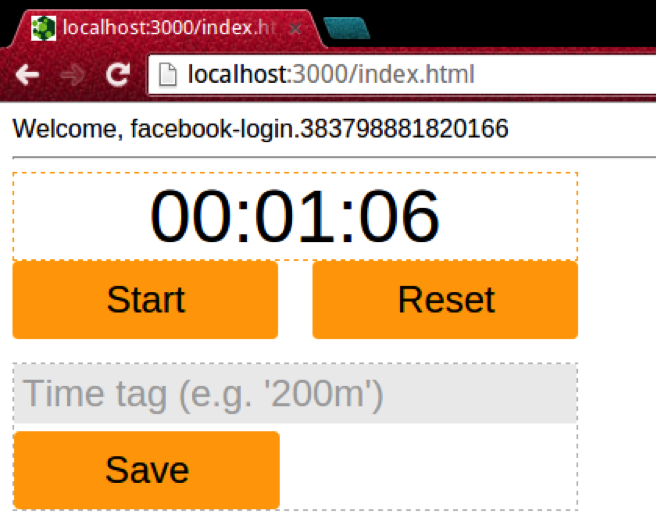 Now the user can either start the timer again, reset the timer, or enter in an optional label and save the timer. If the user enters in a label and hits ‘save’, they then enter the ‘SUCCESS’ state. In a real application you’d have to add a state to account for network errors, but you’re going to skip that step in the interest of keeping this tutorial simple. There are 4 functions, startTimer(), stopTimer(), resetTimer(), and save(), which are exposed to the UI to enable state transitions. In particular, the save() function uses the LoopBack Time model. The Time.create() function triggers a POST request to /api/Times to create a new time. 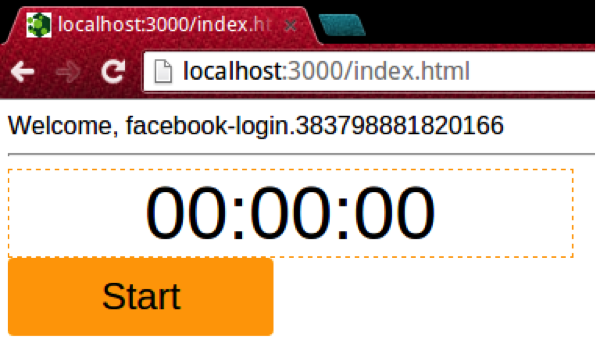 Take a look at the template in templates/timer.html on GitHub. Now that you’ve implemented the actual timer directive, you need to implement one more directive to make this usable. You need a directive that lists all times you’ve saved. Here’s how the timeList directive looks. The timeList directive controller should be pretty straightforward. Most of the logic is related to the color codes, and that’s only to ensure that you get contrasting colors to use as backgrounds for your tag badges. Speaking of the tag badges, let’s take a look at the directive’s template HTML, templates/time_list.html. The template includes 3 simple elements. The first is a delete button that calls the delete() function. The second renders the time’s value in the app’s standard HH:mm:ss format. The third displays the time’s tag, if it exists, using the correct color. Now that you have the timer and timeList directives, how are you going to tie them together? The top-level HTML in index.html is simple. There’s just one subtlety: the NEW_TIME event that the timeList directive listens for. Since the timeList directive doesn’t know when the timer directive has saved a new time, you need to make sure the timer directive communicates with the timeList directive. 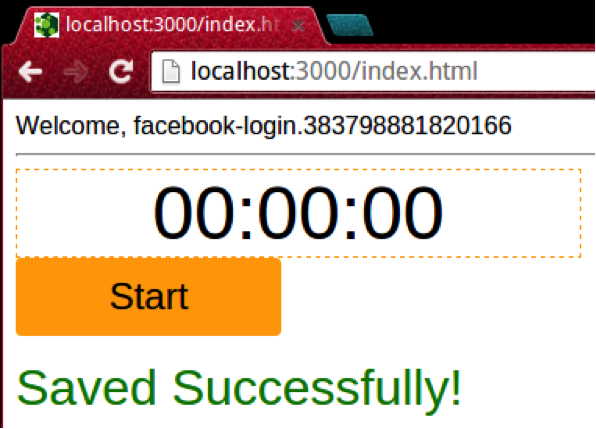 That’s what the onTimeSaved property that you added to the timer directive is for. Congratulations, you’ve just used the LoopBack AngularJS SDK to build an AngularJS client on top of your REST API! In particular, the LoopBack AngularJS SDK provided you with services that enabled you to interact with your REST API in a clean and intuitive way, without touching any URLs. However, you might be concerned that you have yet to do any mobile app development in this series of articles about mobile app development. As you’ll see in the next article, the Ionic framework will allow you to put the stopwatch directives to work in a mobile app with no changes.